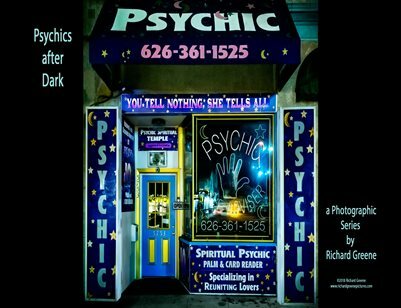 A series about the discovery of palm readers, fortune tellers and psychic shops around L.A. after the sun goes down. In the dark night glow these shops vibrate with life. Their brightly lit storefronts share a language in common, attracting like moths those hopefuls looking for magical answers to impossible questions. These storefront designs have become an outsider form of art with its own unique vocabulary.